2000), showed that uptake of various cationic metals, including cadmium, cobalt, copper and silver, onto fish gills leads to organism mortality, and that the uptake of the metals could be described by conventional chemical equilibrium models, in which the gill was treated as a ligand described by a stability constant and reaction site concentration. In their work, they excised fish gills and analysed the concentration of metals on the gill surface. The toxicity of dissolved metals was shown to be proportional to the accumulation of the metal on the gill (Allen, 2002). Thus, a considerable amount of thermodynamic information on metal accumulation at the biotic ligand (BL) is based on the studies of Playle and co-workers (e.g. Playle et al., 1993). Site concentrations and binding constants, e.g. for interactions between fish gill and metals, hydrogen, and cations, provide a functional description of the accumulation, while critical BL concentrations are based upon dose-response relationships between mortality and accumulation at the gill. A basic assumption of the BLM is that metal toxicity occurs as the result of metal ions reacting with binding sites at the organism-water interface (either physiologically active sites, leading to a direct biological response, or transport sites, leading to metal transport into the cell followed by a subsequent, indirect biological response), which is represented as the formation of a metal-biotic ligand (metal-BL) complex. The concentration of this metal-BL complex directly determines the magnitude of the toxic effect, independent of the physical-chemical water characteristics of the test medium (De Schamphelaere and Janssen, 2002). Hence, the acute toxicity of a trace metal (percent response) to an organism can be calculated when metal speciation, the activity of each cation in solution, and the stability constant for each cation to the BL(s) for that species are known (Heijerick et al., 2002a). The BLM mathematically integrates the interaction of trace metal with solution phase ligands to predict its speciation and its subsequent interaction with receptor sites on the organism. 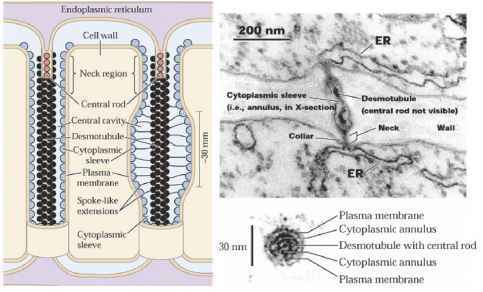 It is, thus, obvious that the BLM includes both the chemical and the biological parts, which enable it to predict toxicity of dissolved metals based on the accumulation of the metal on the receptor site (the gill or other biological membrane in contact with the surrounding medium) (cf. Allen, 2002). The BLM can be used as a computational alternative to bioassays, for example, to evaluate site-specific WQCs. Describing bioavailability as a function of speciation has so far been based on the free ion activity model (FIAM). 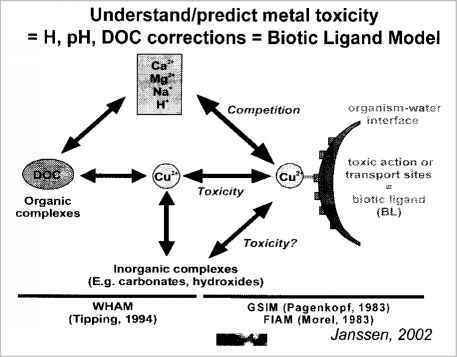 Following the basic concept of the gill surface interaction model (GSIM), developed by Pagenkopf (1983), the BLM has further developed this approach by including competitive interactions at the site, where acute metal toxicity occurs. Thus, BLM is based on the hypothesis that that toxicity is not simply related to the total or dissolved metal concentration, but is dependent on the metal speciation in the water column and interaction processes at the site of toxic action (Figure 6.1). By simulating metal accumulation at this particular site (defined as the BL), toxicity is defined according to the BLM as the metal accumulation beyond a critical threshold. For fish, for example, the BL is either known or suspected to be the sodium or calcium channel proteins in the gill surface that regulate the ionic composition of the blood. Figure 6.1. Conceptual diagram of the Biotic Ligand Model (BLM) showing inorganic and organic complexation in the water and interaction of metals and cations on the biotic ligand (BL). DOC = dissolved organic carbon. Modified after Pagenkopf's (1983) original GSIM model. For other organisms, it is hypothesized that a BL exists and that mortality can be modelled in a similar way. The BL interacts with the metal cations in solution. The amount of metal that binds is determined by a competition for metal ions between the BL and the other aqueous ligands, particularly NOM, and the competition for the BL between the toxic metal ion and the other metal cations in solution, for example, calcium (DiToro et al., 2001). In the BLM, the cation-BL interactions are represented and calculated in the same way as any other reaction of a cation with an organic or inorganic ligand. To that end, the complexation capacity of the BL (analogous to the concentration of other ligands in solution) and stability constants for the metal- and the cation-BL complexes are required and need to be incorporated in a speciation model like the "WHAM" (De Schamphelaere and Janssen, 2002). The "WHAM" or "Windermere Humic-Aqueous Model", developed by Tipping (1994), predicts the interaction between metals and organic matter, based on a relatively simple characterization of the sample for its description. The model has been calibrated with a large number of samples of NOM from a wide variety of locations. The first BLMs predicting acute copper toxicity to fish combined existing data sets on both gill-copper concentrations and stability constants, as well as on toxicity and incorporated them into the metal speciation model "Chemical Equilibria in Soils and Solutions" (CHESS), which includes speciation reactions, adsorption on natural surfaces and solubility control of solid surfaces (Santore and Driscoll, 1995). Also, electrostatic and chemical interactions between metals and natural organic matter were considered, e.g. the metal-DOC (or metal-NOM) complexation according to WHAM was included. It is today generally recognized that the BLM approach permits a rational explanation of the effect of variation in water chemistry on the toxicity of metals to aquatic organisms. Presently, bioassay testing often is applied to ascertain if there is a difference in toxicity at a site from that anticipated by the WQC. However, it is much more cost-effective and introduces less uncertainty if the BLM is used to predict toxicity under a widely varying set of water quality conditions. Therefore, as pointed out by Allen (2002), the BLM promises to be an important tool for use in any scenario where that requires an understanding of bioavailability in relation to water chemistry. To further demonstrate this conclusion, Santore et al. (2001) used a database from Erickson et al. (1996) on copper toxicity to fathead minnow (Pimephales promelas), measured in a wide range of different water qualities (pH ranging from 6.5 to 8.8, Ca2+ from 0.5 to 2.5 meq/l , and DOC from 1-6 mg/l). He could clearly show that total copper in water never is a good predictor of copper toxicity, that Cu2+ only is a constant predictor of copper toxicity when DOC changes, but that gill copper binding is a constant predictor of toxicity as pH, DOC and hardness varies. In fact, the LC50 of copper varied between 10 and 1,000 ^g/l when copper was expressed as Cudissolved , but only between 5 and 12 nmol/g (wet weight) when copper was expressed as "gill-Cu" concentration. Van Sprang (2003) later demonstrated that a significant reduction in intraspecies variability in copper toxicity can be obtained through incorporation of bioavailability (use of BLM) in a wide variety of fish, crustacean and algal species. To summarize, it is clear that, initially, the BLM concept was to a large extent developed using data from the scientific literature. In fact, a first BLM was based on published data regarding accumulation measurements on the gills of fish exposed to copper under various physico-chemical conditions (Playle et al., 1992; 1993) and an established relationship between the gill concentration and the observed effect (MacRae et al., 1999). Based on toxicity data from the literature, BLMs for crustaceans (Daphnia magna, Ceriodaphnia dubia) and fathead minnow (Pimephales promelas) were calibrated to predict acute copper and silver toxicity (Di Toro et al., 2001; Santore et al., 2001). By means of the same methodology, Santore et al. (2002) also calibrated an acute Zn-BLM for rainbow trout, fathead minnow and Daphnia magna, using a number of relevant toxicity data from literature. The fraction of binding sites that needed to be occupied by the trace metal for causing an effect was calculated by fitting the BLM to existing data derived from metal binding experiments with fish gills. It appears that a certain disadvantage with this method is the assumption that binding constants of competing cations are the same for all species. Taking into account the much greater complexity of the mechanism of chronic toxicity, the researchers at the University of Gent developed BLMs predicting chronic toxicity to D. magna of copper (De Schamphelaere and Janssen, 2003) and zinc (Heijerick et al., 2003), see further details below. In addition, the same group of scientists set out to investigate the possibilities and limitations of using the BLM concept for modelling copper (De Schamphelaere et al., 2003b) and zinc toxicity to a green alga (Pseudokirchneriella subcapitata) (Heijerick et al., 2002b). This species was selected because it was found to be the most sensitive green alga among those tested. The study demonstrated that, with some adaptations, the BLM approach may also be applicable to the assessment of ecotoxicity to algae.